Forum member Thomas Haugland (aka “Roe”) from Norway has created an excellent video comparing the features on four long-range scopes: Schmidt & Bender PMII 3-12x50mm, Schmidt & Bender PMII 12-50x56mm, Leupold MK IV, and Zeiss Diavari Victory 6-24x56mm. Thomas shows how the adjustments function, he records the available vertical elevation, and he takes apart the turrets to show how the weather seals work. While the Leupold MK IV has MOA clicks, the three Euro scopes tested by Thomas have mil-based or mil/cm adjustments. These mil-based clicks work well with first focal plane reticles that have mil or half-mil hash marks. In these films I’ve set the Schmidt & Bender PMII 3-12×50 as the benchmark for comparison. Not because it is ‘best’ (it isn’t!) but because S&B is one of the manufacturers which first recognized the needs of professional Long Range shooters and put together products [optimized to work well] in high stress environments. The features that are important are: First focal plane, MIL reticles and MIL turrets, plenty of adjustment and suitable magnification. Note that S&B and Zeiss scopes are also available in the USA with MOA-based turrets and/or second focal plane (SFP) reticles, for those shooters who prefer the MOA system, and SFP. A first focal plane reticle is best for ranging, but a target shooter working at known distances will probably prefer a second focal plane reticle that doesn’t change in size with magnification. 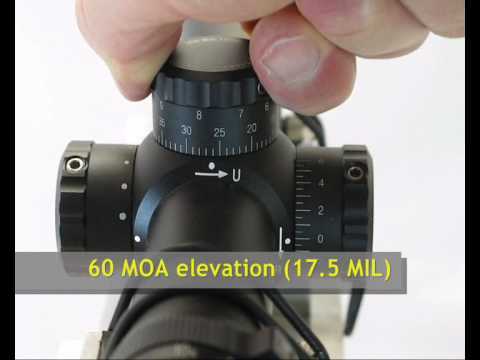 Share the post "Long-Range Scope Comparison: Schmidt & Bender, Leupold, Zeiss"
Sgt. 1st Class James Henderson, a service pistol shooter with the U.S. Army Marksmanship Unit (USAMU), was selected as the Military Marksmanship Association (MMA) Soldier of the Year for 2009. Henderson became the first Soldier in 24 years to win the National Pistol Championship at Camp Perry, Ohio. He won the National Trophy Pistol championship, the President’s Pistol match, and the Interservice Service Pistol championship. He was also a member of the first-place National Trophy Pistol Team and the first-place Interservice Service Pistol team. During the course of 2009, SFC Henderson broke numerous national pistol shooting records and claimed countless other individual and team accolades. He was featured in Sports Illustrated’s “Faces in the Crowd” section and was promoted to SFC in 2009. Henderson first served with the USAMU from 1991-1994 after tours at Fort Benning, Fort Sill and Korea. After a long stint in the Army Reserves, Henderson resumed active duty service and was assigned to the USAMU. Henderson is the only shooter to ever win the “Triple Crown” (President’s Hundred, National Trophy Individual Pistol Championship, and High Team Shooter) in the same year, and he did it twice (2002 and 2009). Share the post "SFC Henderson Named Top Military Marksman for 2009"
If you’re looking for an extremely high-quality, 100% reliable semi-auto rifle for defense, three-gun matches, or predator control, you should consider the Sig556. Based on the Sig 550-series rifles used by the Swiss Army, the Sig556 features a piston/op-rod upper for enhanced reliability. The bolt, bolt carrier, and other receiver internals stay much cleaner and cooler in the Sig556 than with a direct-impingement design such as the AR-15. The Sig556 also features ultra-reliable magazines and a true folding stock as an option. Now through March 8, 2010, Sig Sauer is offering a $300 Rebate on all Sig556 rifles. Customers must purchase a Sig556 rifle from a Sig Sauer commercial dealer before March 8, 2010. NOTE: Rebate Forms must be received by March 22, 2010. Remember, if you wait ’til the last minute to buy, you only have two weeks to submit the Rebate Form. Share the post "Sig Sauer Offers $300 REBATE on Sig556 Rifles"